BRONX — Schools in the South Bronx’s District 7 — considered to be the city’s poorest and lowest-performing district — don’t have the luxury of asking parents to donate money to pay for enrichment activities like arts and music classes. When the city's budgets fall short, schools are on their own, forced to choose between going without or stretching their limited resources even thinner. The Bronx Academy of Letters, however, has found an alternative path. The Mott Haven school at 339 Morris Ave. has become a powerhouse at fundraising thanks to its advisory board which is populated by civic-minded, well-connected and well-heeled New Yorkers in such fields as finance, real estate, advertising and publishing. The school raised more than $400,000, a new record, at a recent fundraiser for the school at Guastavino’s on the Upper East Side in honor of the school's 14th anniversary. The school's success is due in large part to its board, which features boldface names including Joan Sullivan, who founded the school in 2003; her sister, novelist Jenny McPhee (both are the daughters of celebrated New Yorker writer John McPhee); a vice president and executive editor at HarperCollins, a vice president and publisher of Little, Brown and a literary agent who represents the likes of Lena Dunham, David Chang and Anthony Bourdain. 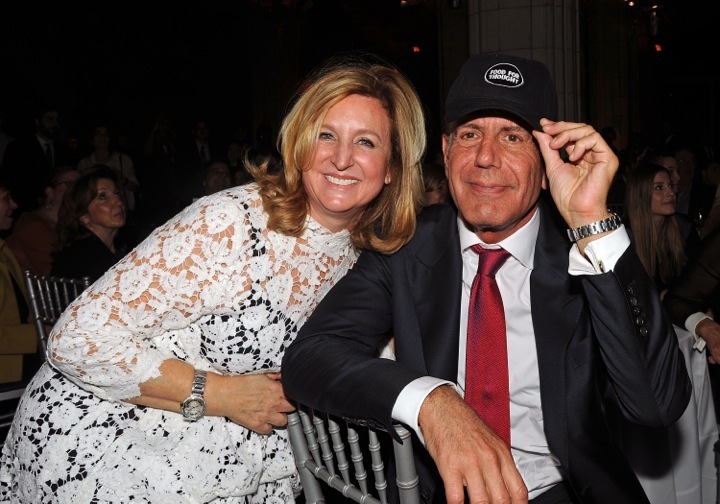 Famed chef Anthony Bourdain hosted the 14th annual fundraiser for the Bronx Academy of Letters. He's pictured here with the night's honored guest and board member, Toni Bernstein. Funds from the event have allowed the school to build out an infrastructure that would have been impossible without them — touching on everything from academics to sports to technology to the arts. They can now afford to take every student from sixth through 11th grade on overnight college trips. The money also enabled the school to buy iPads for an online reading program tailored to students’ needs. The school will bring in mental health counseling next year using some of the funds, and also buy violins — at the students’ behest — for a class where most students are learning to read music for the first time. The cash also helps cover a writers-in-residence and artist-in-residence programs and enables the school to publish a literary magazine and newspaper. Bronx Academy of Letters students Laura Grullion and Jael Rodriguez and teacher Janice Morales with renowned chef Marcus Samuelsson at the benefit for the school. The school also uses the money to help fund their 10 sports teams — an unusually high number for a small school — and it paid for the $15,000 inflatable batting cage the softball team uses in the cafeteria while the basketball team practices in the gym. Cardet-Hernandez said the freedom of having discretionary income even extends to simple things, such as buying snacks like granola for the students to eat at games. Under the DOE's system, principals are required to go though a lengthy ordering process that requires using approved Department of Education vendors and getting three bids to ensure they select the lowest price. It can then take weeks for the delivery, and despite the bidding process — an oversight measure to prevent misuse of taxpayer funds, according to DOE officials — prices of DOE-approved vendors are often higher than what can be found elsewhere, principals across the city say. But Cardet-Hernandez said that by using the discretionary funds, he can now order packages of granola bars via Amazon Prime whenever he needs to feed students at sports games — much like the freedom enjoyed by the Success Academy charter school that’s co-located in his building. Because of the school’s donations, “You can buy granola, and instead of it becoming a larger process, you can say, I’m going on Amazon, and I’ll get it tomorrow and life is going to be good,” said Cardet-Hernandez, noting that having a board is common at charters but not common at public schools. Well-known chef Camille Becerra at the fundraiser for the Bronx Academy of Letters, which included offerings from chefs like April Bloomfield, Danny Bowien and Eric Ripert. Not only do the funds allow him to spend more time in the classroom rather than on paperwork for the vendor bidding process, Cardet-Hernandez noted how the money enables him to fill holes to help make the students “more compelling for college” with additional arts and sports programming. Many students from the Bronx Academy of Letters have been aware of these disparities and started an organization called IntegrateNYC4me to address segregation of city schools and the inequities of resources that come along with that. Cardet-Hernandez believes his school's approach has helped empower his students.